In four months, you've got that big event -- a wedding, reunion or beach vacation -- and you feel your body just isn't ready for it. A 30-pound weight loss will help boost your confidence and health. 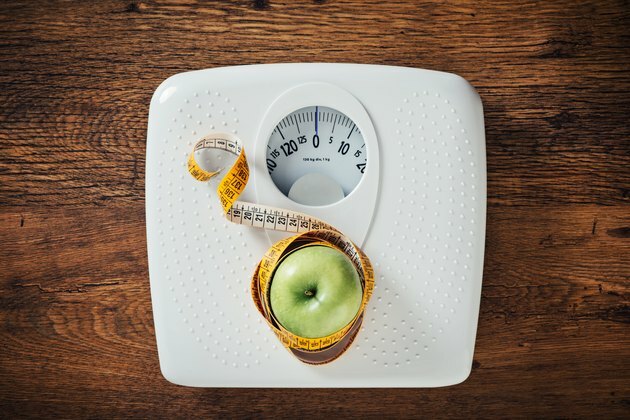 Although you'll have to stick pretty closely to a weight-loss plan that includes a low-calorie diet and concerted exercise, a 30-pound weight loss in four months requires you to lose a little less than 2 pounds per week, which falls into a healthy, manageable rate of loss. One pound equals 3,500 calories -- to lose 30 of them, you must create a deficit of 105,000 calories. That sounds daunting, but when you spread it out over four months, it's just 6,563 calories per week -- or 938 calories per day. You create a calorie deficit by eating less and moving more. To figure out your calorie needs, use a calculation that takes into account your age, gender, weight and activity level. A dietitian or online calculator can help you estimate the number of calories you need to maintain your weight. From that number, subtract about 500 calories to determine how many you should eat, and plan on exercising off another 483 to 500 daily to create the deficit required to meet your goal. For most people, just reducing calorie intake by almost 1,000 calories daily is too aggressive. You don't want to eat fewer than 1,200 calories as a woman, or 1,600 as a man, unless you're on a medically supervised plan. Eating too few calories can leave you without proper nutrition, cause a loss of calorie-burning muscle mass and simply be too restrictive to maintain for four months. A low-calorie diet might bring to mind small portions of pale chicken breasts and celery sticks, but eating well on a low-calorie diet can be done simply by focusing on whole, unprocessed foods that don't contain a lot of refined grains, excess sugar and saturated fat. Cutting out these non-nutritive, high-calorie foods helps you instantly save calories and lose weight. Clear your pantry of chips, processed crackers, cookies, candy and soda and your refrigerator and freezer of frozen dinners, ice cream and bottled sauces and salad dressings. Invest in whole grains, such as brown rice, quinoa and woven wheat crackers, as well as plenty of fresh and frozen vegetables and fruit. Lean protein also features prominently when you're trying to lose weight and is especially to support exercise. White-meat poultry, flank steak, tuna, tofu, eggs and whey protein are good options. Plan each meal to include a serving of protein, whole grains and fresh produce. For example, make oatmeal with low-fat milk and berries for breakfast; grilled chicken stir-fried with broccoli over brown rice for lunch; and broiled flank steak in corn tortillas with grilled peppers, salsa and avocado for dinner. Between meals, satisfy a grumbling tummy with fresh fruit, low-fat cheese or low-fat plain yogurt mixed with a drizzle of honey and blueberries. Consider investing in a kitchen scale and a set of measuring cups and spoons to ensure you're not serving yourself excessive amounts; it's also easy to underestimate portion sizes and surpass your calorie goals, which sabotages your weight loss. If you're new to exercise, gradually work your way up to the minimum 150 minutes per week of moderate-intensity cardiovascular exercise recommended by the Centers for Disease Control and Prevention. This is equal to about 30 minutes of brisk walking five days per week. After a couple of weeks, extend the time you spend exercising so you total at least 250 minutes per week of cardio -- an amount the American College of Sports Medicine says is necessary to see significant weight loss. To burn about 500 calories per day, a 185-pound person needs to walk at a 3.5-mile-per-hour pace for almost 90 minutes, do an hour of low-impact aerobics, pedal 40 minutes on an elliptical trainer or run for 30 minutes at a 9-mph pace. In addition to cardio, plan on two sessions of muscle-strengthening exercise weekly. This offsets the loss of muscle mass that can happen when you create a calorie deficit. If you don't strength-train while losing weight, 25 percent of each pound lost is from lean muscle, explains the American Council on Exercise. That means you'd lose 7.5 pounds of lean muscle when losing 30 pounds if you skip the weights. Losing muscle slows your metabolism considerably, making weight loss hard and weight regain likely. Use dumbbells, barbells, your own body weight, resistance tubing or kettlebells to target all your major muscle groups, including the chest, back, arms, shoulders, legs, hips and abs. Do one or more sets of eight to 12 exercises of each exercise until the muscle feels fatigue. On the days you strength-train, include a little extra protein in your menu plan right after your workout. A scoop of whey protein mixed into low-fat milk or water; a hard-boiled egg with string cheese and an apple; or half of a lean turkey sandwich on whole-grain bread provide the amino acids you need to encourage muscle maintenance and growth. Be sure to count the calories in this protein snack toward your daily total, though. While you're targeting about 2 pounds per week as your rate of loss, it's acceptable and expected that you'll lose at a faster rate in the first one to three weeks as you adjust your eating plan and start exercising. Your loss rate should level off, but if you continue to lose at a rate consistently faster than 3 pounds per week once you're a month in, increase your calorie intake slightly. Losing at a fast rate can lead to complications, including gall stones. Also, remember that weight loss ebbs and flows, so you might lose more one week and less another. Plateaus are inevitable, and you can break through them -- just don't get discouraged when they appear. A smaller body requires fewer calories to maintain, and thus you'll most likely have to reduce calories further to continue to lose weight. For every 5 pounds you drop, you need 25 to 50 calories fewer daily. That means, once you're two months into your goal and about 15 pounds lighter, plan on reducing your intake by an additional 100 to 150 calories or exercise another 100 calories off per day. That's an extra mile walking or jogging. For example, if you lost weight with 1,600 calories per day when you started the plan, you may need to eat more like 1,450 calories two months in to continue to lose at a consistent rate and meet your goal.